So I was surprised to stumble across this Mandrake comic strip from 1939... Let's set aside the ugly racial stereotypes in the dialogue and art for a moment, and just look at the basic structure of this particular comic. A barker encourages Lothar to pay ten cents for a half-hour of entertainment in his arcade. Lothar promptly tries several machines geared to test one's strength in various ways, and he turns out to be so strong that he inadvertently wrecks each machine, seemingly oblivious to both his own strength and the intent of the barker. It's... a gag. From Lee Falk. 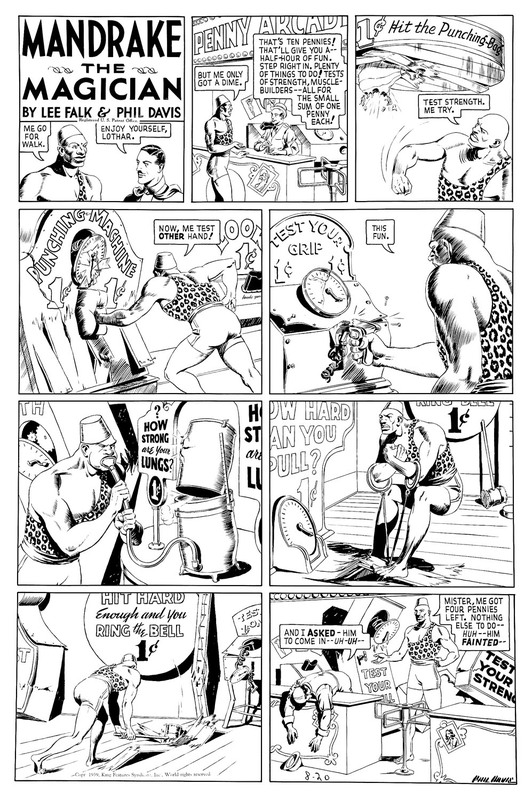 Lee Falk, action/adventure writer, did a gag strip. In a five-year old comic that had been firmly established as not-a-gag-strip. I'm just left scratching my head on what prompted the sudden change for this one strip. Anyone else ever see examples of Falk's attempts at gag strips like this? This is very much like a Popeye strip, but even more like a Fleischer Brothers Popeye cartoon. There's one called "Customers Wanted" from January 1939, the same year as this, in which Popeye and Bluto lay waste to each other's rival penny arcades with similar gimmicks as seen here in a futile effort to get Wimpy as a customer. There are a few others featuring arcade and sideshow settings as well. I wonder if it could have been a deliberate nod to the spinach-loving sailor?